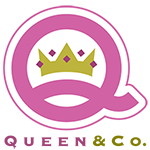 I wanted to play with this gorgeous pink, mint, and gold striped Washi tape. 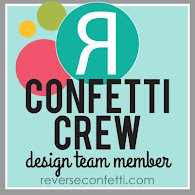 I applied some of this striped Washi over white cardstock and die cut with the Layered Banner Duo from Reverse Confetti. The rest of the card was simple layering of papers with a gold glitter diecut "hello" from Reverse Confetti. Hello! I recently shared this card over on Instagram and thought.....hmm. I haven't shared it on my blog yet! You may have seen it on IG or over on the Taylored Expressions blog earlier this week. I just love how this card came together! Isn't it nice when an idea you have actually works out for a card design? Well.....it did here! I would LOVE for you to read my post over on the TE Blog----->HERE for all the details on how this was made but there's one tip or technique I wanted to share. For my "faux embossing" look with the Leafy Vine Cutting Plate, I first adhered some Stick It adhesive to the back of thick vellum and ran the die through my Big Shot. 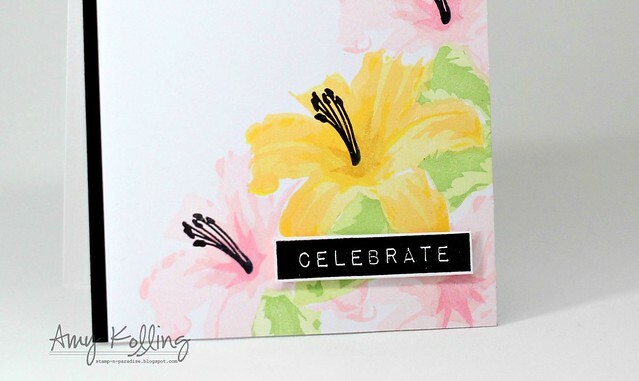 This vellum is amazing and almost gives an opaque look so it's perfect to layer over a notecard for an embossed look! Anyway, thanks so much for sharing a part of your day with me! Hello! 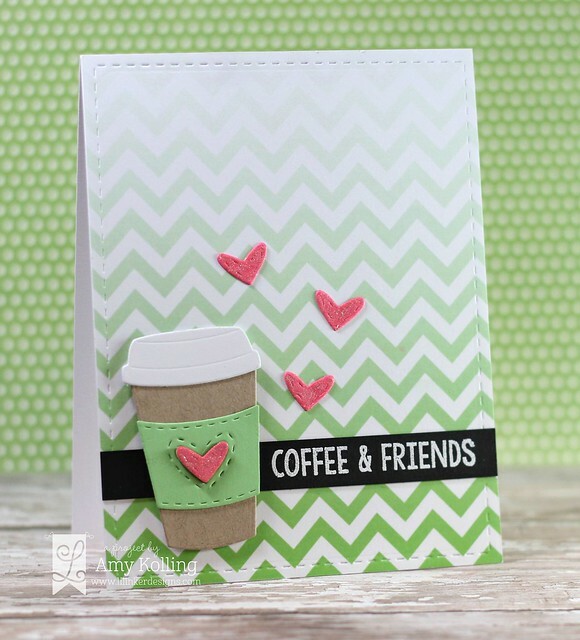 I had a little time to play around last evening so I thought I'd check out the Spring Coffee Lovers Blog Hop that wraps up later today. Now, if you know me.......you'd know that I don't like coffee except in the form of an occasional Mocha Frappe from McDonald's. That being said, I have LOTS of friends that are die hard coffee drinkers. 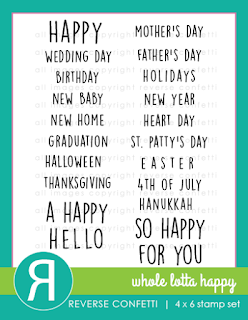 So why not make some cards for them? 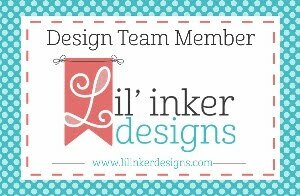 I've used a set called Coffee Cozy and coordinating Coffee Cozy dies from Lil' Inker Designs. This set was new a few months ago along with redesigned Coffee Cozy dies. To a layer of green ombre chevron pattern paper, from the Ombre Chevrons paper collection, stitching was added to the perimenter with Stitched Mats: Rectangles and added to a top folding notecard. I die cut my coffee cozy, assembled, and added over a strip of black cardstock that was white heat embossed with a sentiment from Coffee Cozy. 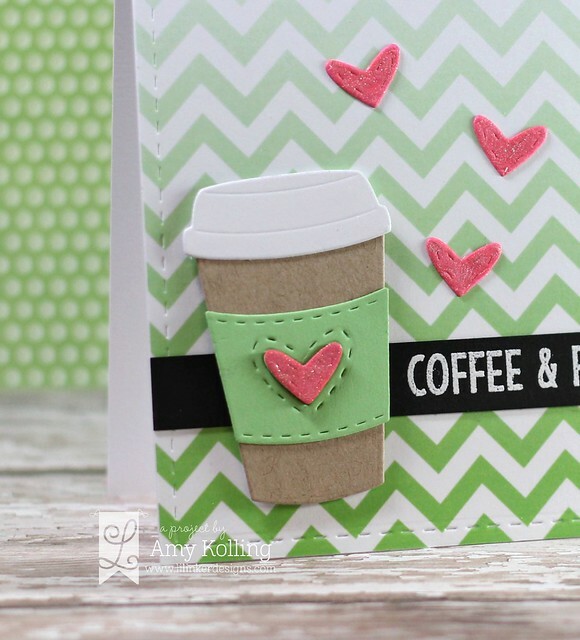 (My cozy was diecut with the smallest stitched heart die from Stitched Hearts Die Set and layered onto my cup.) Lots of Wink of Stella were added to all the hearts for shimmer! I did use the current sketch from over at CAS(E) this Sketch! for my card except I brought the focal point to the bottom of my card instead of the top. Hello! 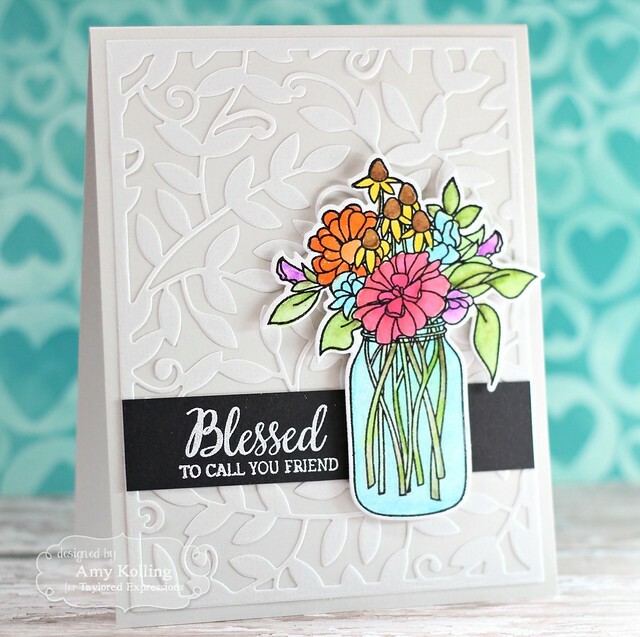 I have a few cards to share using Avery Elle stamps and coordinating dies. Since I was on vacation last week, I am catching up with 2 cards today! 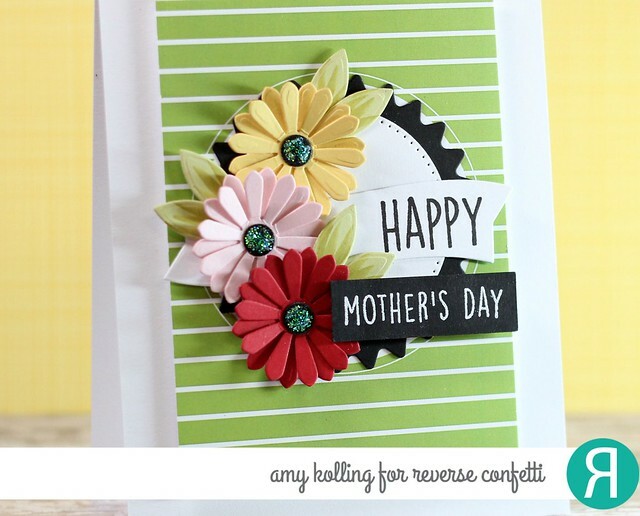 This first card uses the Hats Off stamps and Hats Off Elle-ments dies. There are all sorts of uses for this set but I will need a Father's Day card in the coming months, so I thought I'd get a head start! I started by using the large die from the Finished Frames Elle-ments and diecutting a rectangle out of the middle to create the frame. I also diecut some Pierced Clouds Elle-ments to add to my little scene. The piercing on the clouds adds just the best little details!! All the arms and hats were colored with Copics and adhered with foam adhesive. My second card uses the ADORABLE new set called More Party Animals and More Party Animals Elle-ments. 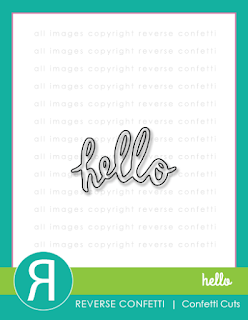 If you liked the mini Party Animal set, you will love this set with more possibilities! I thought it would be fun to use this WHOLE set. To do this, I left all the stamps on the acetate sheet they came on except I removed a few from the lower right corner. To this sheet of stamps, I coated the remaining stamps with Versamark so I could white heat emboss the images onto black cardstock. After stamping with Versamark, I positioned a piece of trimmed black cardstock over the stamps and rubbed which transferred the Versamark to my black cardstock so I could white heat emboss. 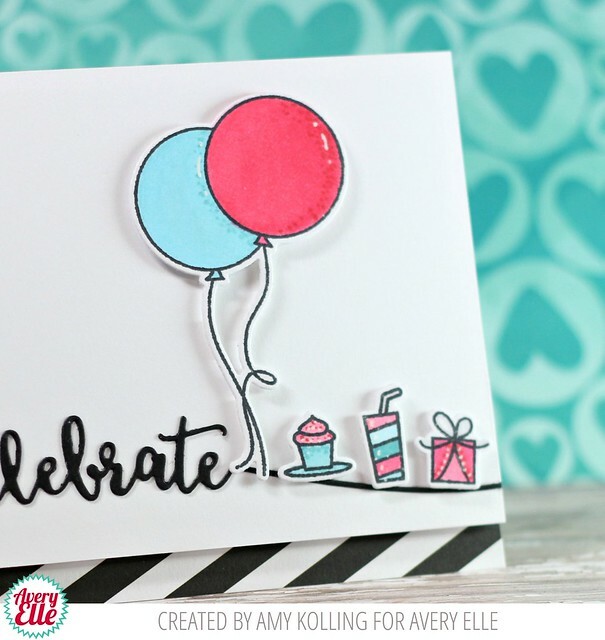 I was going for a fun COLORFUL card with these images, so I stamped/diecut the balloon animals out and colored with my Zig Clean Color Real Brush Markers. Gosh I LOVE these markers! As a final touch, I added my balloon animals with foam adhesive and applied lots of clear Wink of Stella for shimmer! Hello! We are back from a fantastic vacation to Aruba and it's good to get back into the swing of things. 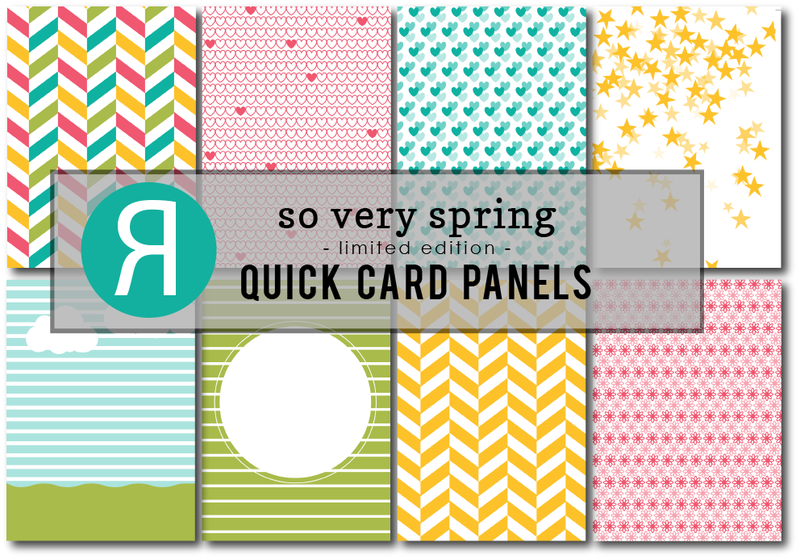 I have a card to share that was actually made for this past Reverse Confetti release and was featured in the RC Newsletter. 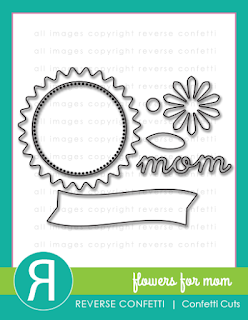 I absolutely LOVE this new Confetti Cuts called Flowers for Mom. I've diecut several flowers to make some layers, added the black centers with Stickles, and the leaves that were given some life with a few flicks of a Copic marker. My flowers were attached to the circle dies from Flowers for Mom and one of the new QCP this month called So Very Spring. 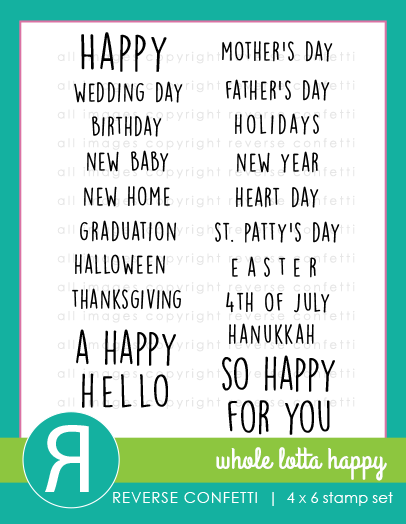 I added in a sentiment from Whole Lotta Happy which is a VERY good set to have in your stash! Pretty Pink Posh Easter Week! Hello! This week is Easter theme week over on the Pretty Pink Posh blog and I'm sharing this Easter card over there. 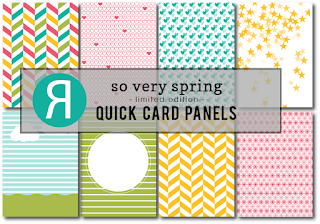 I've used Birdie Friends and coordinating dies along with the Mini Tags Dies for my Easter themed card! Don't forget to check out my full post over on the Pretty Pink Posh blog today! Since this sketch had all those layers (and I'm not a good layered girl), I thought I would use some pattern paper to help me out. I chose papers from Just Sayin' by MME. I love the soft colors and patterns that just "go" together without much thought. 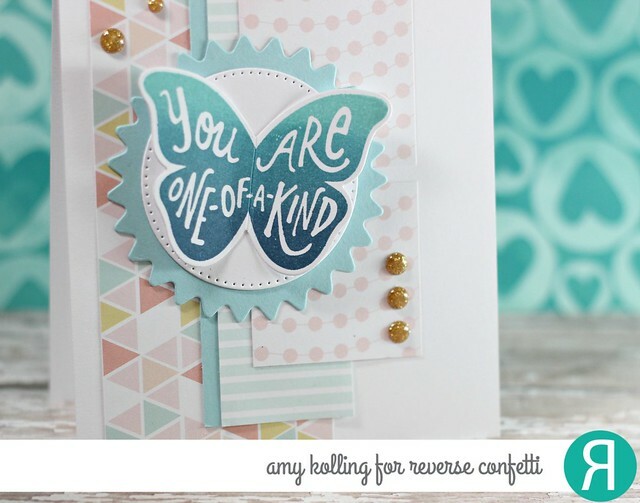 I stamped my butterfly, from Butterfly Dreams, in Pool to Navy ombre ink from Hero Arts and die cut with the coordinating Butterfly Dreams Confetti Cuts. My butterfly was layered onto the die cuts from Flowers for Mom Confetti Cuts. To pull in some of the gold color from the pattern paper, I added gold glitter enamel dots. Hello! 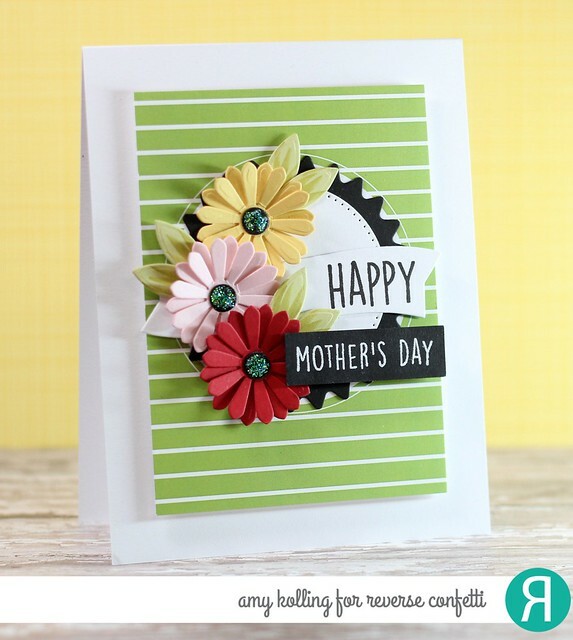 I thought I'd share ONE of my THREE cards I made during our Stamping Away weekend! I wasn't real productive but I had so much fun! One of the sets I played with was this amazing layering set from Altenew called Layered Lily. I played around a lot with this but decided to do a collage of blooms in the lower right corner with LOTS of masking and layering of color. All the inks used were pigment inks from Fresh Ink, Avery Elle, and Amuse. My simple sentiment, from Label Love, was stamped in bold black, trimmed, and added with foam adhesive. Hello everyone! 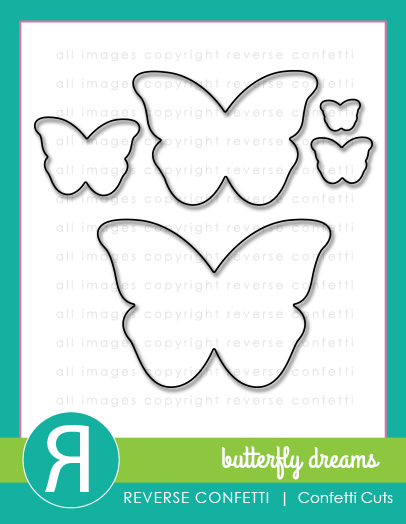 I was recently inspired by a project I created for a crafty weekend I help co-host. We made hoop art with felt flowers and used the gorgeous felt from Taylored Expressions. I wanted to transition and use some of this felt for bright felt flowers for a card! I would love for you to check out this project with full details over on the Taylored Expressions blog HERE. I knew I wanted to create a "window" using the new Window Frames Dies. What better than a shaker card, right? I stamped my branch image, from Birdie Friends, inside my frame, added leaves, and iridescent Mini Heart Confetti. To make my shaker, I used the Window Frame Dies to make a frame by cutting them both at once. I Copic colored the tiny birdies and nests from Birdie Friends and mounted them on top of the shaker for more dimension. 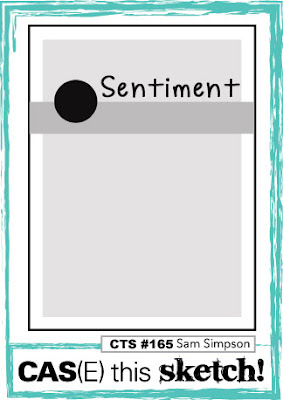 To add the sentiment, I white heat embossed the smaller sentiments on tiny strips of black cardstock and trimmed into a flag with my scissors. There will be 2 (two) $25 gift certificates up for grabs. 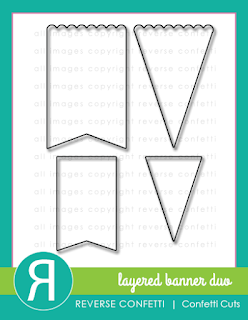 Winners will be picked randomly along the blog hop. Comments must be left by 11:59 PM PST on 3/14/2016. Winners will be announced on the PPP blog. March Verve Diva Inspiration Hop and some news! NEWS: This is my THIRD anniversary being a Verve Diva and I have decided to step down. This was not an easy decision as I can vividly remember the email from Julee extending a welcome email opportunity for the Verve Inspiration Team. It was the perfect fit!! I love my Verve! So, this is my LAST Inspirations Blog Hop! :( Thank you Julee for 3 wonderful years! With this month's inspiration photo, I could not let it go by without doing more watercolor stripes. I sure hope you aren't tired of me sharing them with you! Just look at those vibrant stripes in that bedding!!!! So in the spirit of stripes, I watercolored Twisted Citron, Wilted Violet, and Salty Ocean onto watercolor paper in a pattern that resembles the bedding. To keep the bold vibe going, I stamped the sentiment from Be Blessed in Versafine Onyx Black in the center. 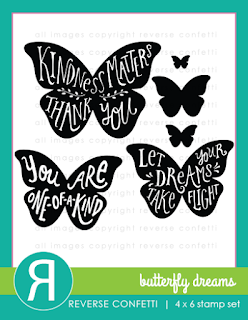 A butterfly from Blue Skies was stamped in Versafine Onyx Black, heat embossed with clear embossing powder, and die cut using the All Aflutter dies. This give a TRUE black embossed image! Love the results! 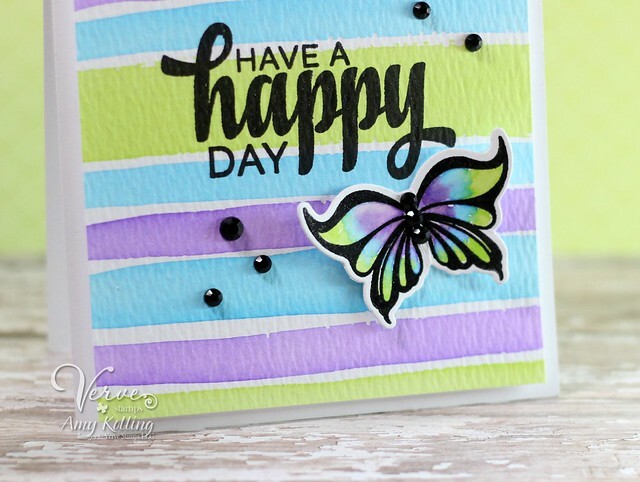 I watercolored my butterfly with the same color palette as the background and added some black rhinestones for "bling". Hello! Today I have been playing with the stamp set called Skating By from Avery Elle. Of course, the focus of this set is the large image of the girl skating. I thought I would focus on some of the small images also included in this set. It's a great way to get more uses out of a set like this! 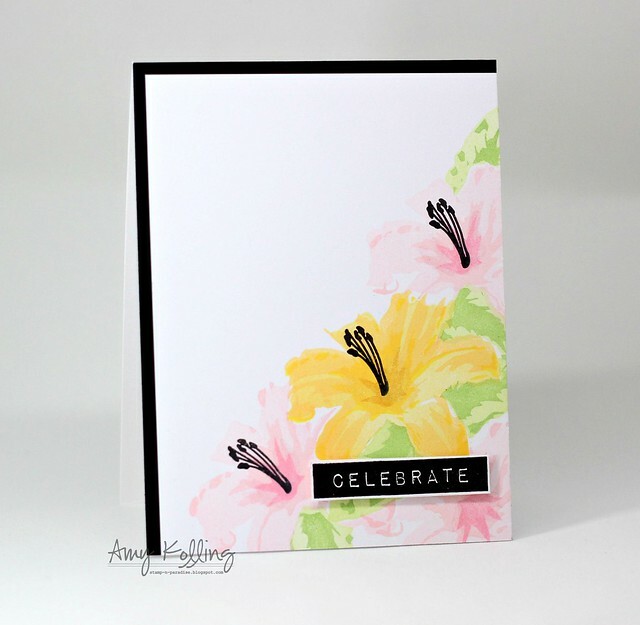 I started by die cutting the Celebrate from the Sentimental Ellements dies with black cardstock to fit across my trimmed white cardstock panel. I used the sentiment as a place to "ground" my smaller images. All the images were Copic colored and cut out using the Skating By Ellements. The balloon image was used as a focal point to my card. 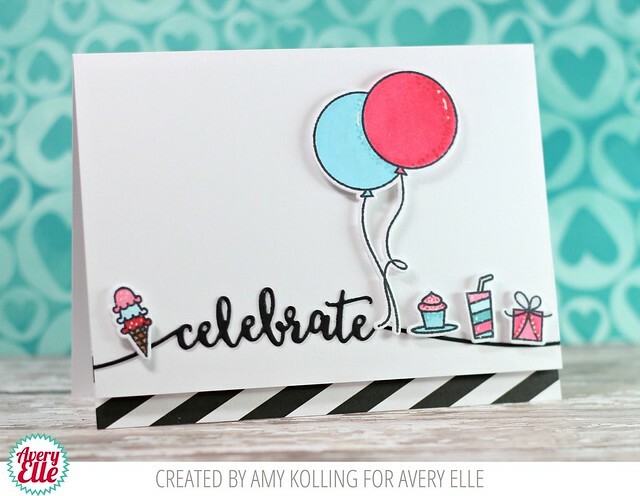 To finish the card, I foam mounted my assembled panel over a white notecard with a piece of striped paper from The Neutral Paper Collection by Avery Elle. 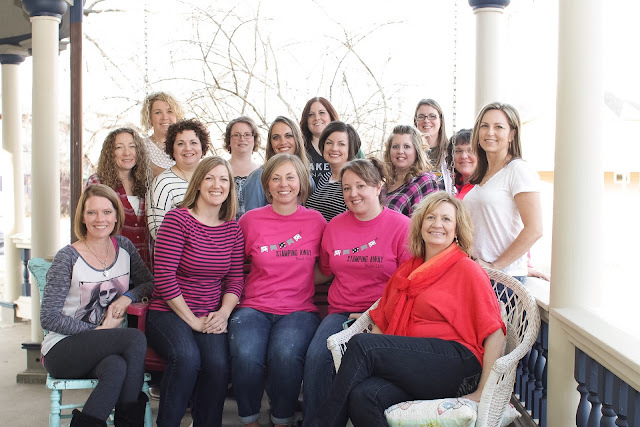 Sugar Pea Designs 2nd Birthday Bash Celebration!